Treat your hair to the body-building properties of Grow Gorgeous Full Bodied Volumising Shampoo, a cleansing formula that promotes thicker-looking locks. Enriched with a unique blend of proteins, the volumising shampoo helps to care for hair whilst delivering reparative benefits and inspiring full-bodied lift and bounce. Helping to plump-up the appearance of fine, skinny strands, it combines Pea Peptides with a lightweight active micro-emulsion; together, these ingredients help to build-up the appearance of flat tresses whilst repairing and protecting without weighing hair down. The shampoo utilises touch-to-style technology for easy styling at your fingertips; simply tease and rustle your hair into shape for effortless, full-bodied volume. Expect fuller-looking hair with light-reflecting shine. Wet hair thoroughly before applying a generous amount. Lather and massage from the scalp through to the ends. 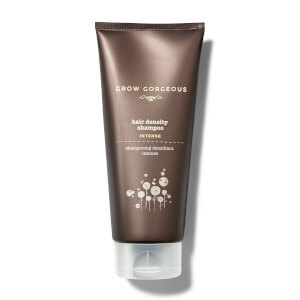 Rinse and follow with Grow Gorgeous Full Bodied Leave-in Conditioner for best results. Just gorgeous! Oh that is tbe name of the product. Well it is indeed. It is the first time I enjoy a shampoo this much. The smell is amazing even the package smells the same. After rinsing my hair I left to dry naturally and dear God I have never had a softer hair and I am 35. I will definitely be repurchasing this product. Please do not change it. Well I’ve tried this shampoo for a few weeks now, I was unsure about this product after reading reviews, some people saying you needed loads for it to lather and that it’s drying on the hair, I then noticed these reviews were from people with thick hair that wanted it thicker. Greedy :-) I’m just jealous!! My hair is thin and greasy after one day!! I have tried thickening shampoos and anti grease shampoos nothing does both till now!!!!! This product is amazing!! It works!!! It’s for people with thin lank hair!! That’s me!!! This does lather up perfectly (as I have thin hair not thick hair wanting it thicker) My hair is fab!!! I don’t have to wash it everyday and it’s double the thickness!! Please don’t ever change this product. And thank you shampoo gods!!! !